While reading 1 Samuel and 2 Samuel, I came upon a well-known story of David dealing with the transportation of the Ark of the Covenant to Jerusalem. After failing the first attempt in transporting the Ark, David tried a second time after correcting his mistakes (see 1Chr. 13 and 14) to successfully bring the Ark to Jerusalem. In this story, we find in not only just the Israelites playing music all along the way, but also David ending the journey with music and dancing. After reading this, I began to think, “What exactly was the role of musical instruments in the Old Testament?” I had read plenty of stories that included the use of instruments, but what was their intended purpose? Moreover, were they used in praise to God? Even deeper than that, were they used strictly for leisurely praise outside the temple or were they also used during specifically instructed praise inside the temple? In examining this topic, I think that it would be beneficial to start from the very beginning. The very first mentioning of instruments in the Old Testament comes from Gen 4:21 His brother’s name was Jubal; he was the father of all those who play the lyre and pipe. This is the first mentioning of instruments; however, there is no mention that it was used for any sort of praise to God. As a matter of fact, the use of instruments in the book of Genesis is seen for nothing more than for some form of a festival or party. An example of this would be in Gen. 31 when Laban came after Jacob asking why Jacob didn’t let him send Jacob away with instrumental music of mirth. Going on in time a little further we can find one of the first uses of instruments in praise to God in Exo 15:20-21 Then Miriam the prophetess, the sister of Aaron, took a tambourine in her hand, and all the women went out after her with tambourines and dancing. (21) And Miriam sang to them: “Sing to the LORD, for he has triumphed gloriously; the horse and his rider he has thrown into the sea.” From there on we have many verses throughout the Old Testament that speak of praise to God through instrumental music such as Psa 144:9 I will sing a new song to you, O God; upon a ten-stringed harp I will play to you,. Moreover, there are many verses mentioning instruments in praise to God outside of the temple, but were there any restraints to these uses around the ark or inside the temple? To begin answering the previous question, once again we must start in the beginning. We can see in Numbers 10:1-10 when Moses’ law was given that there were instruments used for specific occurrences. Looking specifically at verse 10 it says, “On the day of your gladness also, and at your appointed feasts and at the beginnings of your months, you shall blow the trumpets over your burnt offerings and over the sacrifices of your peace offerings. They shall be a reminder of you before your God: I am the LORD your God.” One well stated comment on this says, “Notice that God does not leave it up to the people to decide for themselves about the use of the instruments. First, there must be two trumpets and they must be made of silver. Second, there are times when both can be sounded and times when only one can be sounded (vs. 3-7). Third, only the priests can blow the trumpets (v. 8).” (http://www.jbmyers.net/other-content/instrumental-music-in-the-old-testament/) Furthermore, from these verses we can see that instruments were used at appointed feasts and on days of rejoicing. Moreover, we can gather that the instruments were given a specific design and purpose when used in the place of God, and it can be inferred by the rest of the Mosaic Law that in use of these instruments the Israelites were to turn “neither to the right or to the left”. 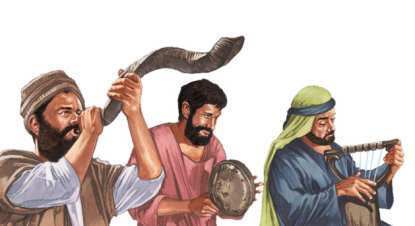 In other words, the Israelites had these specific purposes for using the instruments in the place of God, and there is no inference that they could use them around the ark as they pleased. These are the things that I hope that you have gathered: instruments were used as pleased outside the place of God, and when around the ark (which is inside the temple later on) the instruments had a specific design and purpose in which there was no adding or taking away (Deut. 4:2). I bring the previous information to closure because it may be about to get a little confusing. In the time of David, we can see the use of instruments used leisurely outside of the worship ceremonies pertaining to the ark, and that was okay. Furthermore, as I continued to dig I found that David also added more instruments to the worship ceremonies pertaining to the ark and the temple. “Two places where we can read the account of the musicians being given their assignments are 1 Chron. 6:31-48 and 25:1-31. David begins preparation for the temple in 1 Chron. 22 and continues with this preparation, along with exhortation to the people, until his death in 1 Chron. 29. Appointing the musicians was part of this preparation and, as far as I can tell, was as well received by God as the rest of the preparation and exhortation.” (http://www.truthmagazine.com/archives/volume24/TM024121.html) As was said by this writer, David gave instrumental assignments to people in the preparation of the temple, and it says in 2Chr. 25 that these assignment were for “in the house of the Lord”. Therefore, it seems plainly spoken here that instruments were used in worship to God in the temple. We can also see this plainly said in 2Ch 29:25 And he set the Levites in the house of the LORD with cymbals, with psalteries, and with harps, according to the commandment of David, and of Gad the king’s seer, and Nathan the prophet: for so was the commandment of the LORD by his prophets. From this we can gather that there were indeed instruments in the temple used for worship, and we can also gather from the previous verse that this was in accordance to God’s will. Something important to note here is that 2Chr. 29 is about a king named Hezekiah, and he was restoring the Temple to its order after having strayed from its divinely instructed purpose. Moreover, what can be gathered is that Hezekiah saw a specific requirement for instrumental use in the House of the Lord. “ 1) Hezekiah did not feel he had the right to change the temple worship from what it was originally. This is why he brought back David’s instruments and Moses’ trumpets. 2) The instruments were limited to only those authorized by David and Moses. God had only authorized certain kinds of musical instruments to be used in the temple worship and Hezekiah is careful to observe this. Verse 26 of 2 Chronicles 29 says, “So the Levites stood ready with David’s instruments, and the priests with their trumpets.” According to verse 25, this was done “in the way prescribed by David…” 3) Both Moses and David acted by divine authority when they introduced instruments since it was commanded by the Lord.”( http://www.jbmyers.net/other-content/instrumental-music-in-the-old-testament/) Hezekiah’s example tells us something very simple, yet commonly overlooked: that there were instruments in the Temple, but they were used with strict supervision and only by the authority of God. When worshipping correctly, the Israelites didn’t use instruments as they pleased, and they didn’t use different instruments other than what was instructed. They turned neither to the left nor to the right. Now, I promised that this may get confusing, and here it comes. Some confusion comes when you begin to look at some different outlooks on the subject of instruments: specifically pertaining to Amos 6:5 and 2Chr. 29:25 and their commentaries. Amo 6:5 who sing idle songs to the sound of the harp and like David invent for themselves instruments of music, and 2Ch 29:25 And he set the Levites in the house of the LORD with cymbals, with psalteries, and with harps, according to the commandment of David, and of Gad the king’s seer, and Nathan the prophet: for so was the commandment of the LORD by his prophets. Here we can see two seemingly contradictory verses (since Amos 6 starts with “woe to them….”), but as usual with seemingly contradictory verses, there’s a lot more context to look at. Moreover, Clarke in commentary on 2Chr. 29:25 uses Amos 6:5 as his reasoning for his drastic contrast to what we have previously seen in reference to instrumental worship. “Moses had not appointed any musical instruments to be used in the divine worship; there was nothing of the kind under the first tabernacle. The trumpets or horns then used were not for song nor for praise, but as we use bells, i.e., to give notice to the congregation of what they were called to perform, etc. But David did certainly introduce many instruments of music into God’s worship, for which we have already seen he was solemnly reproved by the prophet Amos, Amo_6:1-6. Here, however, the author of this book states he had the commandment of the prophet Nathan, and Gad the king’s seer; and this is stated to have been the commandment of the Lord by his prophets: but the Syriac and Arabic give this a different turn – “Hezekiah appointed the Levites in the house of the Lord, with instruments of music, and the sound of harps, and with the Hymns of David, and the Hymns of Gad, the king’s prophet, and of Nathan, the king’s prophet: for David sang the praises of the Lord his God, as from the mouth of the prophets.” It was by the hand or commandment of the Lord and his prophets that the Levites should praise the Lord; for so the Hebrew text may be understood: and it was by the order of David that so many instruments of music should be introduced into the Divine service.”(Adam Clarke’s Commentary on the Bible; 2Chr. 29:25) Clarke here gives a completely different outlook on the subject of instruments used for God’s worship. He says that they were never given divine authority. Moreover, he goes on to say that 2Chr. 29:25 has a completely different interpretation that proves his point. However, is Clarke correct? I believe that the answer is found by recognizing the context of Amos 6:5, and what it may be inferring that is not contradictory to our given translation of 2Chr. 29:25. In examination of the context of Amos 6:5 it is seen that the people that are being degraded in the eyes of God are being degraded for their self-serving lifestyles. “However, Israel is being condemned for its pride and luxuriant lifestyle in the context…”(http://www.bibletalk.net/articles/christian-worship.html) The verse states that they were incorrect for two reasons: singing idly and creating instruments. The first being incorrect because they are not singing with any sort of understanding or meaning behind it (either singing words of praise without meaning it or just singing gibberish). (Albert Barne’s Notes on the Bible) The second can be implied from the context to mean that they are being compared to David in the fact that they created instruments for themselves, but condemned because they did so without any God given authority. Consider what I have previously stated, “Hezekiah’s example tells us something very simple, yet commonly overlooked: that there were instruments in the Temple, but they were used with strict supervision and only by the authority of God.” This example by Hezekiah is also seen by Solomon, Josiah, Nehemiah, and more!(2Chr. 8:14, 2Chr. 35:15, Ezra 3:10, Neh. 12:35-36) This is an important aspect to consider when examining Amos 6:5 because by these examples we can infer that the addition of more instruments seen here was not under the same pretenses as when David did so. When David did so it was by divine authority, and when his successors did so it was by the example of David. Moreover, in each of those cases we don’t see where God is condemning them for the use of these instruments. Therefore, in the case of Amos 6:5 we can gather that they did add instruments, just as David had added instruments; however, they must have added instruments without the instruction of God and contrary to the example of David. Most probable due to the context is that they added instruments that David had not added. From all this my formulated opinion on the matter should be clear. There were indeed instruments in the Temple of God, and they were used in praise to God. However, the role these instruments played was evidently an exclusive role. Just as with every other Law that God had given the Israelites up to this point in time: the Israelites were to turn neither to the left nor to the right. Moreover, the Israelites had been given divine instruction on what instruments to use and when to use them, and to add more instruments or to use them incorrectly would be in direct violation of God’s will. In closing, I would like to leave a couple of questions for all my Christian readers to ponder on. Would you agree that God still demands us to follow specific instructions on how to worship Him as He did in the Old Testament? If so, what specific worship-instructions do we have in respect to musical instruments. Posted on October 13, 2014 by dgaskins08	This entry was posted in Uncategorized. Bookmark the permalink. ← Ruth’s Proposal: What are the details of her proposal, and what do they mean?